However, despite their antipathy to proposals for easing the constraints of the gold standard on individual central banks, Mises and Hayek never succeeded in explaining why a central-bank expansion necessarily had to be stopped. Incorrect. Von Mises most certainly did elucidate on the final consequences of a credit expansion fueled by Central banks. Rather than provide such an explanation they instead made a different argument, which was that the stimulative effect of a central-bank expansion would wear off once economic agents became aware of its effects and began to anticipate its continuation. This was a fine argument, anticipating the argument of Milton Friedman and Edward Phelps in the late 1960s by about 30 or 40 years. Which creates in the words of von Mises the crack-up boom. Which is the end consequence: the zero demand for fiat money. I wonder if this chap, although he quotes the books, ever actually read the books? But that was an argument that the effects of central-bank expansion would tend to diminish over time as its effects were anticipated. It was not an argument that the expansion was unsustainable. Just because total income and employment are not permanently increased by the monetary expansion that induces an increase in investment and an elongation of the production process does not mean that the investments financed by, and the production processes undertaken as a result of, the monetary expansion must be abandoned. Yes it does. If the roundabout production relies on savings to complete, the removal of pseudo-savings of a credit expansion, prevents completion, and reveals the investments already made as mal-investment. The monetary expansion may cause a permanent shift in the economy’s structure of production in the same way that tax on consumption, whose proceeds were used to finance investment projects that would otherwise not have been undertaken, might be carried on indefinitely. Here the author claims that tax increases investment. That is a claim that government spending from tax revenues equals investment. A tax is a present value cost. Increase present value costs, you reduce saving, consumption spending and holding of cash by individuals. The tax passes to government. Now you need to indicate what government spending is not consumption spending, but is rather investment spending. Needless to say, the author makes no attempt to actually do so. Simply an empty statement that on a reading without analysis looks erudite, but is actually zero content. So the Austrian theory has never proven that forced saving induced by monetary expansion, in the absence of a gold-standard constraint, is necessarily unsustainable, inevitably being reversed because of physical constraints preventing the completion of the projects financed by the credit expansion. That’s the first problem. It has been proven, many times. Reacting to the management changes? The disappointment of the earnings? Just trading with the market? Who knows. All I know is that at the moment I’m glad I have a little extra time on the options. Hurricane Sandy probably helped Obama’s re-election chances. It will have given him the chance to demonstrate leadership qualities leading the clean-up etc. Cancelling all election appearances definitely was the way to go. Nothing Romney could have done. Serendipity. After all that is said and done, it is pretty irrelevant who actually wins the election. Neither candidate really seems to have even a vague idea in relation to the economy on which military might and everything else ultimately rests, so whoever actually wins…whatever. I just feel that so close to the election, Sandy, favoured the incumbent. (Reuters) – Major U.S. stock exchanges expect to reopen on Wednesday after Sandy, the worst storm to hit New York in nearly 75 years, closed trading for two days. NYSE Euronext (NYX) said the New York Stock Exchange would open as usual, although it was prepared to switch to fully electronic trading if necessary. Nasdaq OMX’s Nasdaq Stock Market was also to be operating on Wednesday, as were BATS and Direct Edge Exchanges. I have officially been offered a place at Auckland University Law School for 2013. This chap seemingly is a Federal Trade Commisson economist. He has a blog, which seemingly is used as an apologist platform against Austrian economics. I am an economist at the Federal Trade Commission. Nothing that you read on this blog necessarily reflects the views of the FTC or the individual commissioners. Although I work at the FTC as an antitrust economist, most of my research and writing has been on monetary economics and policy and the history of monetary theory. In my book Free Banking and Monetary Reform, I argued for a non-Monetarist non-Keynesian approach to monetary policy, based on a theory of a competitive supply of money. Over the years, I have become increasingly impressed by the similarities between my approach and that of R. G. Hawtrey and hope to bring Hawtrey’s unduly neglected contributions to the attention of a wider audience. This is [refer to the link] a rebuttal of one, possibly more, of his posts on Austrian economics. Even though he has written that he no longer considers himself an Austrian economist, George Selgin remains sympathetic to the Austrian theory of business cycles, and, in accord with the Austrian theory, still views recessions and depressions as more or less inevitable outcomes of distortions originating in the preceding, credit-induced, expansions. In a recent post, George argues that the 2002-06 housing bubble conforms to the Austrian pattern in which a central-bank lending rate held below the “appropriate,” or “natural” rate causes a real misallocation of resources reflecting the overvaluation of long-lived capital assets (like houses) induced by the low-interest rate policy. For Selgin, it was the Fed’s distortion of real interest rates from around 2003 to 2005 that induced a housing bubble even though the rate of increase in nominal GDP during the housing bubble was only slightly higher than the 5% rate of increase in nominal GDP during most of the Great Moderation. Agreed. Note the red herring of GDP being introduced. Consequently, responses by Marcus Nunes, Bill Woolsey and Scott Sumner to Selgin, questioning whether he used an appropriate benchmark against which to gauge nominal GDP growth in the 2003 to 2006 period, don’t seem to me to address the core of Selgin’s argument. Selgin is arguing that the real distortion caused by the low-interest-rate policy of the Fed was more damaging to the economy than one would gather simply by looking at a supposedly excessive rate of nominal GDP growth, which means that the rate of growth of nominal GDP in that time period does not provide all the relevant information about the effects of monetary policy. GDP growth reflects the growth in the money supply. So to counter Selgin’s argument – which is to say, the central argument of Austrian Business-Cycle Theory – one has to take a step back and ask why a price bubble, or a distortion of interest rates, caused by central-bank policy should have any macroeconomic significance. In any conceivable real-world economy, entrepreneurial error is a fact of life. True. Agreed. However, while that is true, a depression requires a cluster of entrepreneurial error. Malinvestments occur all the time; resources are, as a consequence, constantly being reallocated when new information makes clear that some resources were misallocated owing to mistaken expectations. Again true, but you also have to account for the clustering of the malinvestments which are entrepreneurial error. To be sure, the rate of interest is a comprehensive price potentially affecting how all resources are allocated. But that doesn’t mean that a temporary disequilibrium in the rate of interest would trigger a major economy-wide breakdown, causing the growth of real output and income to fall substantially below their historical trend, perhaps even falling sharply in absolute terms. The rate of interest is the time preferences of the aggregate with a component of risk added. If the rate is set by the free market it reflects the natural rate of interest as best estimated by the market. If the rate of interest is set by the Central Bank it does not reflect time preferences nor does it add any component for risk. It is an arbitrary number set by the Central Bankers. If this rate is incorrect, which it almost always is, it very much will trigger an economy wide breakdown. Correct. They are unsustainable because the savings required to fund the longer more roundabout processes of production are not available. They have not been saved. Thus to complete the longer production processes, savings must be “created” by the central bank. The classic Austrian formulation is that the interest-rate distortion causes excessively roundabout production processes to be undertaken. Correct. The interest rate distortion suggests that “savings” are available for investment, when in point of fact they are not. The interest rate is an arbitrary choice of the central bank. Incorrect. Resources are not shifted. They are not shifted, because there is no saving, forced or otherwise. Investment is purely driven by credit expansion. At a certain point, the credit expansion must cease, and at that point, the unsustainability of the incomplete investment projects or even the completed, but excessively roundabout, production processes becomes clear, and the investments and production processes are abandoned. Correct. They cease when the credit creation drives inflation, or the loss of purchasing power of money to a politically unsustainable point. As the credit expansion is ended, there are no “savings” to complete the roundabout productive processes. The capital embodied in those investment projects and production processes is revealed to have been worthless, and all or most of the cooperating factors of production, especially workers, are rendered unemployable in their former occupations. Although it is not without merit, that story is far from compelling. There are two basic problems with it. One error, and it is a major error, has already been identified. That error actually refutes the entire argument. But let’s continue anyway. First, the notion of unsustainability is itself unsustainable, or at the very least greatly exaggerated and misleading. Why must the credit expansion that produced the interest-rate distortion or the price bubble come to an end? I have already indicated the reason: inflation. 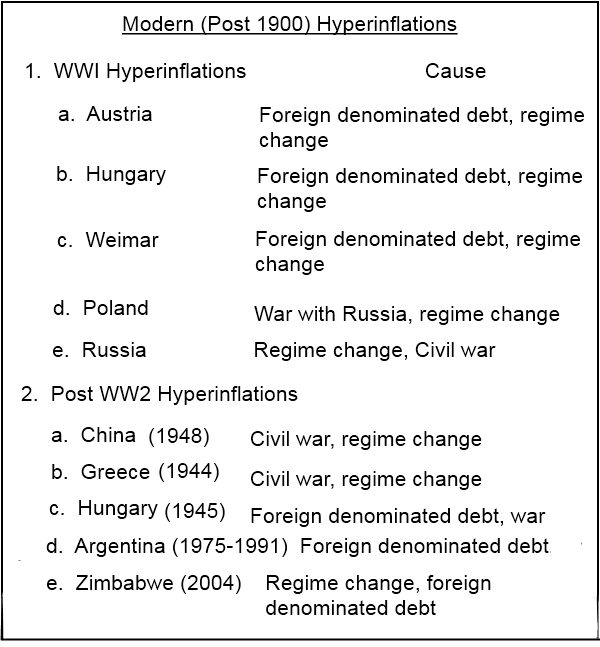 Inflation that is not checked will increase until the demand for money falls to zero and a hyperinflation destroys the fiat paper. Well, if one goes back to the original sources for the Austrian theory, namely Mises’s 1912 book The Theory of Money and Credit and Hayek’s 1929 book Monetary Theory and the Trade Cycle, one finds that the effective cause of the contraction of credit is not a physical constraint on the availability of resources with which to complete the investments and support lengthened production processes, but the willingness of the central bank to tolerate a decline in its gold holdings. There is a constraint on resources. Any resource that has a price is scarce. If it wasn’t scarce it would have no price and not be an economic good, it would be free. Second if the fiat paper is backed by gold and is convertible into gold on demand, then the Central Bank is limited in its expansion of credit upon the volume of gold with which to meet that demand. As a credit expansion continues in time and volume the demand for real money, gold money will grow, which will halt the creation of fiat as it no longer can be redeemed upon demand. It is quite a stretch to equate the demand of the central bank for a certain level of gold reserves with a barrier that renders the completion of investment projects and the operation of lengthened production processes impossible, which is how Austrian writers, fond of telling stories about what happens when someone tries to build a house without having the materials required for its completion, try to explain what “unsustainability” means. Obviously from the previous argument, it is not difficult at all. The original Austrian theory of the business cycle was thus a theory specific to the historical conditions associated with classical gold standard. It was. That however does not invalidate the theory in today’s environment of a pure fiat money that is unredeemable into a hard money. Hawtrey, whose theory of the business cycle, depended on a transmission mechanism similar to, but much simpler than, the mechanism driving the Austrian theory, realized that there was nothing absolute about the gold standard constraint on monetary expansion. He therefore believed that the trade cycle could be ameliorated by cooperation among the central banks to avoid the sharp credit contractions imposed by central banks when they feared that their gold reserves were falling below levels that they felt comfortable with. Mises and Hayek in the 1920s (along with most French economists) greatly mistrusted such ideas about central bank cooperation and economizing the use of gold as a threat to monetary stability and sound money. So essentially what Hawtrey was saying was that co-operation by Central Banks…I won’t call to redeem your paper into gold if you don’t call on me to redeem my paper into gold…was the answer.